Available in 68 decadent shades, Urban Decay's new, reformulated shadows promise decadent colors, amazing pigmentation, long-lasting crease-free finish, and easy blendability. I did swatch-test most of the colors at Sephora, and here's the second set of swatches - purples and plums this time. And here's me: Used Urban Decay's Rockstar (the eyeliner, not the eyeshadow) along the upper lashline. Applied UD's primer in Sin over the smudged liner. Wowww what a collection you have Rads? Are you a purple lover too??? Looking good Rads! 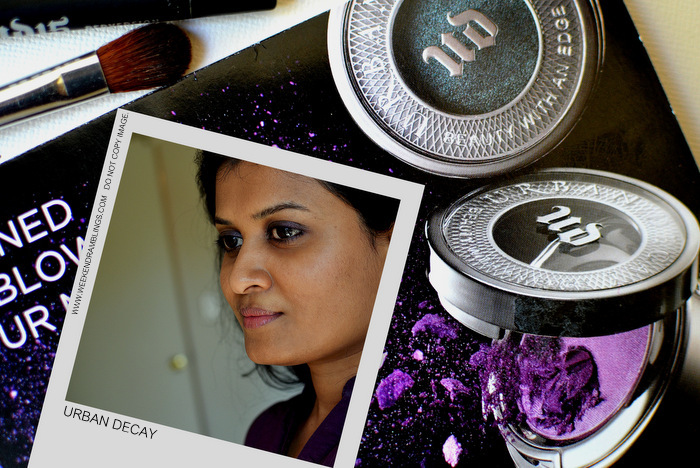 :) Rockstar is one of my favourite purples, I wish I could find a cream eye shadow in the exact same color!! Looking good, Rads! You inspired me to pull out my Urban Decay eyeshadows yesterday and use them. I got the 15th anniversary palette awhile back but I hadn't used it much. Hi Fieran :D Oooh the 15th Anniversary Palette - that's my fav so far..I just amn't that enthusiastic about all the nekkid ones they have..
Hehehe. I have only the first version of that Nekkid palette and I do like it but almost never reach for it. I have to force myself to use it because I'm too much of a smoky-look lover..I almost always wear a gold, olive, black, grey, blue, or green smoky look that neutrals are just not my go-to. That said, you might like Gunmetal (the grey shade) .. but it's available in other palettes or on it's own too. I'm craving Pistol which is from version 2.0 but I think it might be available as a single. The two things I love most about UD shadows are blendability and long wear. It just lasts the whole day with whichever primer I use and is so easy to blend. You know I actually bought the 15th Anniv palette for Evidence ;) But I also love Half Truth. I got Evidence in one of those Sephora samples....haven't yet figured out how to use it..somehow blues don't seem to suit me unless they are blackened out considerably..
Hmm, you could use it as a crease shade with a brown all-over lid shade. Maybe a nice, neutral chocolate brown with a bit of shimmer, and then evidence in the crease to give it a bit of mystery?